Ensuring that patients, visitors and staff can quickly and easily find their way around a hospital is an important factor. It goes without saying that using the correct signage for evacuation routes during a fire or any other emergency is critical, so ensuring that your NHS premises comply with the relevant health and safety standards is something to take seriously. To avoid any confusion to staff or patients, the safest route must be clearly defined to prevent serious injury and negligence claims. The health and safety signs used in the healthcare industry differ slightly from those used in other industries. At Seton, we cater for these differences by offering NHS Estate Signs in our extensive range of products. All NHS Estate Signs are fully regulated and meet the expected standards set by the respective ruling bodies, including being designed in accordance with the NHS Wayfinding Guidance which superseded the previous Hospitals Technical Memorandum (HTM 65). The document outlines effective wayfinding and signing systems for healthcare facilities. These NHS wayfinding signs have a few differences to other signs, partly because of the regulations and rulings that apply to them and partly to cater for people with impaired vision and other disabilities. The NHS Wayfinding Guidance regulations must be adhered to, as well as complying with BS EN ISO 7010. Therefore, in addition to the widely-recognised symbols usually found on health and safety signs, these signs use a flame symbol alongside the universally-recognised fire exit symbol. Knowing your exits - Hospital environments are not only busy places, but there’s a high likelihood that those on the premises will not be very familiar with the layout of the buildings. Having well placed Fire Exit Signs is important to ensure everyone can get out safely and quickly in the event of an emergency. Thanks to the contrast between the background and foreground colours, our signs are easily noticeable - even in low-light conditions! Straightforward messages - These NHS Estate Signs are designed to show the nearest exit in case of an emergency, such as with our ‘Fire Exit Running Man - Up Arrow’ NHS Signs. With a clearly understandable image, speakers of different languages will be able to understand it without issue. Ensuring the arrows on these signs point to the most accessible route for escape is the most important factor to consider before securing to a particular location. Use in conjunction with other signs - Fire Action Signs should also be placed at regular intervals around NHS working environments, as these will prompt a speedy reaction if a fire takes hold. The instructions given by these signs detail the steps that staff and visitors should take in the event of an emergency. They list important information, such as which member of staff is on fire action duty, the phone number of the local fire service and the steps to take after raising the alarm to proceed with the emergency evacuation process. Correct placement - By choosing the most suitable locations to display your signs, you can help to ensure that they are visible at all times. Ideally, each corridor should have a clear sign that indicates the direction to the nearest fire exits. Additionally, these exits should themselves by clearly marked. All of our signs can be affixed securely in place, feel free to look at our Sign Fixings for more information on the options available. 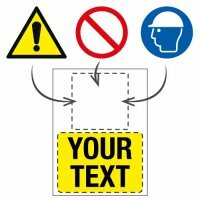 Also, check out our full range of health and safety signs. All of our NHS Estate Signs are available in a wide range of durable materials including vinyl signs, which are ideal for affixing to curved or flat surfaces with minimum effort. Our rigid plastic option is not only tough and long-lasting but also fully recyclable and can be upgraded to include a glow-in-the-dark finish. Whatever material you choose, our range of Sign Fixings will ensure that they are set securely to any surface, including a permanent adhesive backing suitable for both the indoor and outdoor placement of signs. It is perfect for rigid plastic signs and for affixing signs to places where drilling holes is not ideal. It is also suitable for damp and uneven surfaces, and the sealing properties of the adhesive mean it can also be used as a sealant.